I have been counting down the days until NYFW since the couture collections came out. Honestly, if there were a massive fashion event every week (granted, there probably are and I just miss them), I would be the happiest little peach in the entire world. Give me ALL THE FASHION all the time. I will never get sick of it. I live and breathe fashion month twice a year, devour couture and pre-fall collections. I even found myself obsessing over men's fashion this summer (I will not confirm nor deny whether or not it was for the sole purpose of seeing what Harry Styles would look good in...)(FINE, I admit it, I was pretending to be his stylist for a hot second because I'm a little bit nutty. I swear, it was the heat). When the collections go live on Style.com – errr, I mean Vogue Runway – I will sort through them all. I need to see everything that's going on. I want to see what fabrics are a trend, what sort of hemlines are in, are pastels still a thing for spring or has there been a switch between colors. Last fall, there were a lot of earthy tones and metallics, something typical for fall rather than spring collections. And, vice versa, there appeared to be more pastels and light colors in the fall collections. Everything is topsy turvy in the fashion world, which is part of what makes it so interesting. I always look forward to see what style pant will be in (are culottes still going to be a thing? Flared jeans? Tailored trousers? WHAT'S GOING TO HAPPEN? What do I need to buy?). But, alas, I always have my favorites, the designers who I need to see. The ones I would give an arm and a leg to see live. New York generally features more ready-to-wear styles, the standard sizing that is mass-produced in comparison to other collections. I love its "casual" nature compared to LFW for avant-garde, Milan for high-end, and Paris for haute couture. Sadly, the Olsen twins are moving their show to Paris this year, so The Row show will be pushed back a couple of weeks. BUT, in exciting news, celebrating the opening of their new store in New York, Givenchy's show will be moved to NYFW! Exciting times for fashion! 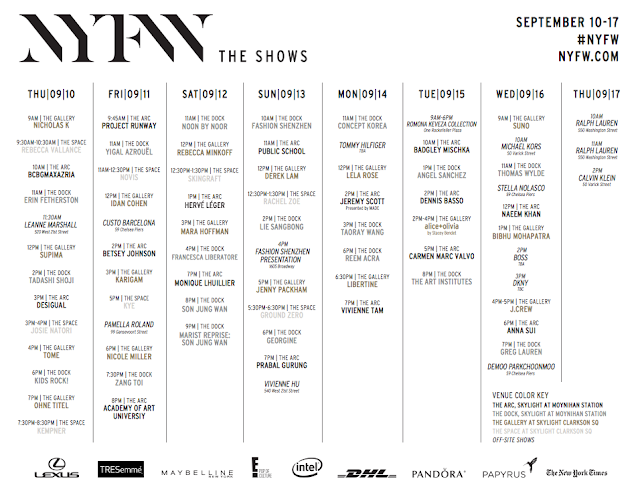 Are there any designers that you're looking forward to during NYFW?